I’ve heard many a sermon preached on this day over the years and many of them have focussed on what, for many, seems like the obvious message of today’s Gospel but I’m going to take us on a little bit of a different track. However, first for those of you who may not have heard a “traditional” Annunciation sermon I will highlight the usual points. Tradition tells us that Mary was but a young girl at the time that these events took place and from scripture we know that she was unmarried but betrothed (think of it as engaged), it’s stated clearly twice and implied another time in today’s reading that she was a Virgin. Can you imagine for a second that you’re a young girl, engaged to an older man, in a society with a strict moral code and a penchant for stoning harlots to death and someone tells you (albeit an angel) that you are going to fall pregnant? What would you do? I can tell you what I would do…after changing my soiled clothes I’d either pack up and get out of there or run away screaming thinking I’d lost my mind (and from Gospel stories we know how the mad were treated!). But is that what Mary did? She didn’t, to her credit she appears to have listened calmly to the message, maybe she played it over in her mind and she replied with a resounding “May it be done to me according to your word”. The traditional Annunciation sermon will often branch of now to talk about how we must all strive to have the faith of Mary; how we too must be ready to answer the call when God comes knocking. Now don’t get me wrong, this is a lovely idea for a sermon and it is one message that can be taken from this event in the life of the Blessed Virgin and our Saviour, however there is a much deeper message to be found within the words of today’s gospel that goes right to the heart of what it is that we believe as Christians and it is this that I want to draw out today. There are two truths that the Archangel Gabriel’s message highlights in today’s reading; one is that Mary will conceive in her womb, she will find herself with child, and the second is that the child she will bear will not be that of her future husbands but will instead be the very son of God. Now I know right now you’re all thinking I’m a bit loopy, we all know that the reading says that, we all heard it and we all believe it, but it really hasn’t always been the case. In the days of the early Church there was a Bishop called Nestorius who was Patriarch of Constantinople one of the great leadership roles in the early Church. Nestorius however, did not believe that Jesus was born the Son of God. Nestorius taught that when Jesus was conceived in the womb he was a man human, like you and I; it wasn’t until later that the Son of God, something divine, came down from heaven and joined with the human Jesus. Now, to the rational of mind this might sound more rational, Jesus was born the normal way and then he got a super spiritual hit of Holy Ghost from God to become our Saviour, no need to reject what we know about human conception. However, is this what the scriptures tell us? Is this the faith that the Apostles and Early Christians bled and died for? It most certainly is not! 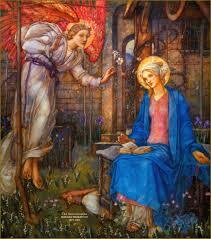 The Archangel said to Mary, “”The Holy Spirit will come upon you, and the power of the Most High will overshadow you. Therefore the child to be born will be called holy, the Son of God.” The Archangel did not call Jesus the Son of Joseph, nowhere in the accepted teaching of the Church has this ever been the case. The child that was conceived in the womb of Mary was a miracle, the product of God’s divine intervention in this world. As Christians we need to not be afraid of standing up for this long held and defended belief. Some of you may know that amongst other things, I am a science teacher, and as someone with a love for the natural sciences we need to not be afraid of saying things that seem “odd” not everything in the world can be explained by Science. In fact, take the idea of the Big Bang, do you know that it was first suggested by a Catholic Priest of the Roman Church? His name was Georges Lemaitre and Einstein thought his physics was atrocious though now many accept his work as truths. It may shock some of you to know that I have actually heard clergy deny the idea of the Virgin Birth, that it was even possible. It seems to me that we are all too quick to try and explain the miraculous away with rationalism. Nowhere in the Scriptures and words of Christ are we told that our God is a rational God who only works according to our finite understanding of the universe! Instead, we see evidence of a God that is bigger than us all, a God who stands outside of the realms of our finite minds and is the author of the laws of this Universe. I’m most sure that when we stand before his throne we will be amazed at the natural laws that exist that we have no idea about. So there are two things that I want you to take away from today’s celebration of the Annunciation to the Blessed Virgin Mary. The first is that it was indeed a real event, that the Church has always taught it and that if we are to be true to our Christian heritage we too must accept it and keep teaching it. The second is to always be open to the miraculous, Mary knew that her faith in God could not be limit by her finite understandings, she didn’t need to question the miraculous, she understood that all our finite minds can do is say yes to God and be prepared for the life of miracles that is sure to follow. In the name of the Father, and of the Son and the Holy Spirit. Amen.